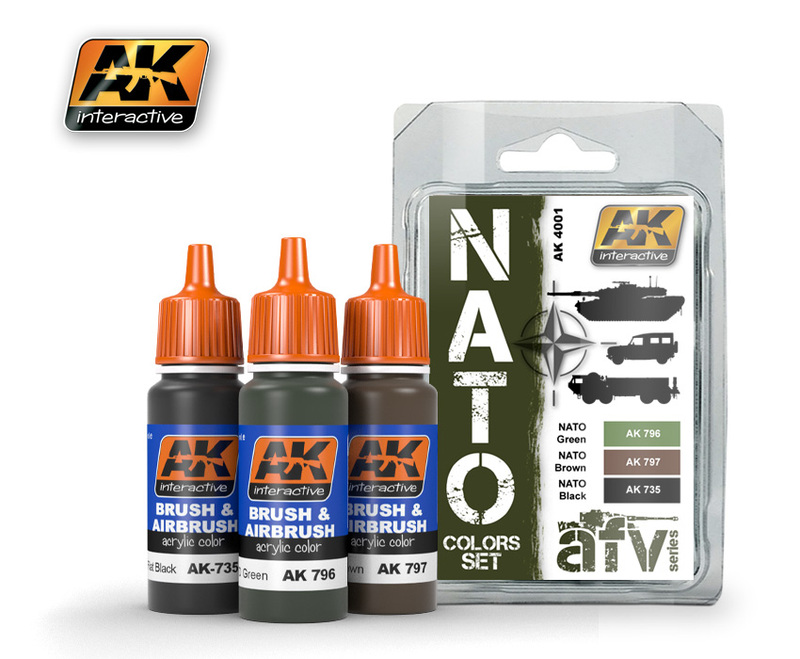 The three colours in this set will allow you to recreate the vehiclesused by NATO troops, deployed worldwide. This set includes green,brown and black colours, common for all NATO camouflage in alltheatres of confl ict. These are accurate colours, with a little modificationfor downscaling. The formula of these acrylic is designedfor both brush and airbrush, and are soluble in water, meaning noodours, as you would expect from the more aggressive solvent-basedpaints. Our acrylics are manufactured by AK-Interactive, andare made from our own formula which prevents problems with themdrying in the airbrush. NATO Colors Set The three colours in this set will allow you to recreate the vehiclesused by NATO troops, deployed worldwide. 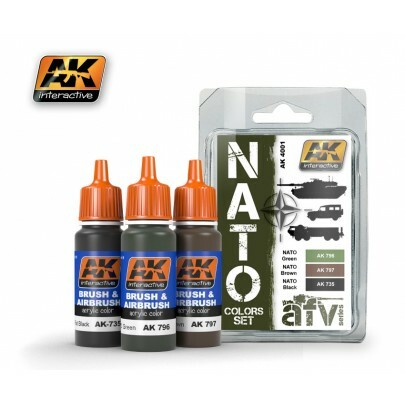 This set includes green,brown and black colours, common for all NATO camouflage in alltheatres of confl ict. These are accurate colours, with a little modificationfor downscaling. The formula of these acrylic is designedfor both brush and airbrush, and are soluble in water, meaning noodours, as you would expect from the more aggressive solvent-basedpaints. Our acrylics are manufactured by AK-Interactive, andare made from our own formula which prevents problems with themdrying in the airbrush.